Based in Beijing and Shanghai, Hui Zhong Law Firm was founded in 2013 as one of the first Chinese law firms to specialise in dispute resolution and has significant experience in the field. The practice, comprising 12 partners, is led by co-founders Xinguang Cao and Ning Fei in Beijing. Cao, who served as senior partner of Haiwen and Partners for 21 years, was one of the first arbitrators appointed by the China International Economic and Trade Arbitration Commission (CIETAC). Fei led the dispute resolution group at Jun He Law Office for five years and worked at the CIETAC’s secretariat. Senior consultant Shengchang Wang is the former vice chairman and secretary general of CIETAC who was controversially imprisoned for being part of a tribunal that ruled against Chinese interests in the PepsiCo arbitration, a major Sino-Western dispute of the 2000s. The episode made Wang a champion of the arbitral community. The firm often serves as co-counsel for other international law firms on the GAR 100, such as Clifford Chance, Freshfields Bruckhaus Deringer and Herbert Smith Freehills. Financial services clients are prominent users of Hui Zhong, including the Bank of China, China Everbright and Hong Kong’s Core Pacific-Yamaichi. In other sectors, the firm has acted for IBM, Hugo Boss, Swiss multinational ABB, US water treatment company Culligan, Danish bio-tech company Novozymes, US flash memory manufacturer SanDisk, Shanghai Electric and Shanghai SECCO Petrochemical Company Limited, one of China’s largest joint ventures. The firm has minimised its clients’ losses in arbitrations, ranging from an UNCITRAL claim over a contract for the importation of soybeans to a CIETAC claim involving the Beijing subsidiary of the NBA. The firm has also engineered advantageous settlements. The Chinese subsidiary of US chemicals provider Lubrizol retained the firm for parallel SIAC and SHIAC proceedings over a construction dispute and found itself settling the disputes after the firm adopted effective strategies in both proceedings. The firm also represented a case of US$33 million at the HKIAC involving sale of goods arbitration, and secured a satisfactory settlement for its client. Hui Zhong reached a settlement in a US$35 million cross-border HKIAC arbitration with a against a Japanese supplier. The firm built a case that forced the other side to the negotiating table on the second day of the hearing with the result that the supplier withdrew its claim. Hui Zhong recently helped a Taiwanese client settle a US$110 million claim against the Chinese government over the transfer of land use rights. The firm continues to act (alongside Clifford Chance) for a US private equity firm in a US$300 million CIETAC dispute over a restaurant chain. In another significant matter, it is acting for China Central Properties in a US$1 billion real estate dispute, helping to coordinate related litigation in China, Korea and Barbados. Hui Zhong played a lead role in drafting amendments to the SCIA arbitration rules, including its authority to hear investor-state dispute settlement cases and to administer cases under UNCITRAL rules – the first mainland Chinese arbitration institution to do so. In 2017, Hui Zhong welcomed to the practice Jing Liu, a former deputy secretary-general of the HKIAC’s Shanghai office. Yvonne Percival, a Mandarin speaker and Eversheds’ former joint chief representative in Shanghai, also joined the team. Despite Hui Zhong’s relatively short history, the depth of experience and high standing of its members are widely acclaimed – each of Hui Zhong’s lawyers have practiced law for a number of decades. Many are key players in the world of international arbitration and transnational litigation. They have served as leading legal counsel, co-counsel and legal experts in hundreds of significant and complex cross-border commercial disputes, appearing before courts and arbitration bodies in a variety of jurisdictions. Moreover, Hui Zhong’s lawyers are on the panels of multiple arbitration and mediation institutions, including CIETAC, BAC, SHIAC, SCIA, CCPIT/CCOIC, SIAC, HKIAC, AIAC. Their expertise spans a wide range of areas, including energy & resources, finance, real estate, joint ventures, M&A, engineering and construction, sales and purchase agreements, intellectual property, technology transfer, international investment agreements such as BITs and employment law, etc. 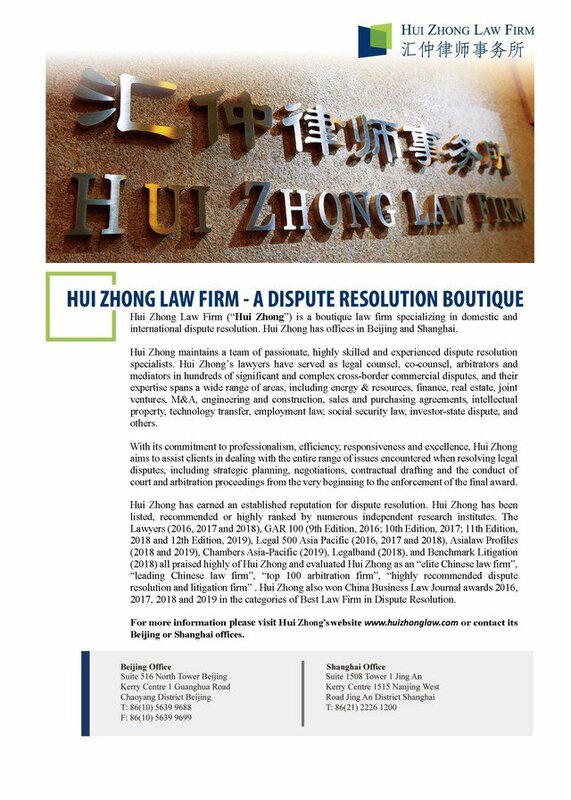 With their commitment to professionalism, efficiency, responsiveness and excellence, Hui Zhong’s lawyers excel at teamwork. Over the past five years, Hui Zhong has achieved a remarkable success in international arbitration. Hui Zhong’s handling of complex, multi-jurisdictional, multilingual and high profile arbitrations earned it the reputation of a rising star. The disputed amount in some of the cases exceeds US$ 100 million. Hui Zhong has been listed, recommended or highly ranked by GAR 100 (2016, 2017, 2018 and 2019), Legal 500, Chambers & Partners Global and Asia-Pacific, The Lawyer China Elite, Legalband, Asialaw Profiles, Benchmark and China Business Law Journal. More details about Hui Zhong can be found on its website (www.huizhonglaw.com), including biographies of Hui Zhong’s lawyers.